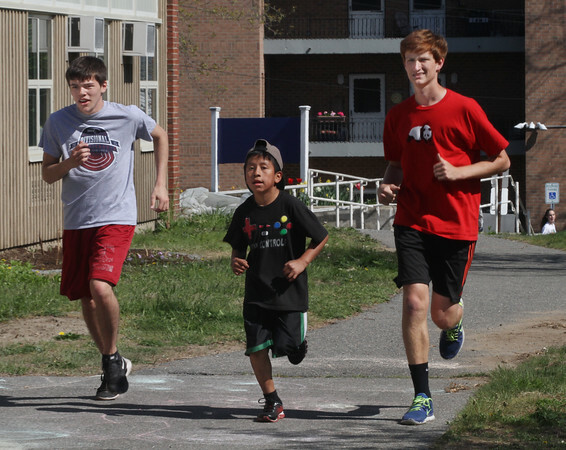 Gloucester High School varisity track runners Justin Tucker, left, and Alex MacDonald, right, both seniors, run alongside fourth grader Mauricio Perez during a mentoring visit Thursday by a group of GHS track team members to the Veterans Elementary School Running Club. The high school athletes talked to the running club members about the middle and high school track programs and gave the younger students advice on how to warm up and run. The Veterans School Running Club, directed by teachers Steve Mirandi and Mary Weinstein, meets after school every Thursday during the warm months.